Our 6th annual FandangObon Festival! Encuentro workshops on October 6 with art and gardening workshops, and FandangObon Festival on October 7! Join the circle as we bridge the participatory music and dance traditions of Fandango of Veracruz, Mexico rooted in African, Mexican and indigenous music; Japanese Buddhist Obon circle dances in remembrance of ancestors; and West African dance and drums of Nigeria and New Guinea. Hundreds of folks of all ages and cultures will celebrate connections to each other and our environment! With Quetzal Flores and Martha Gonzalez of Quetzal, Nobuko Miyamoto, Nigerian Talking Drum Ensemble, Le Ballet Dembaya, and more. Presented by JACCC, Great Leap, Inc., Artivist Entertainment, and Sustainable Little Tokyo. We are excited to welcome Familia Mizumi as our visiting artists and keynote speakers for FandanObon Festival 2018! 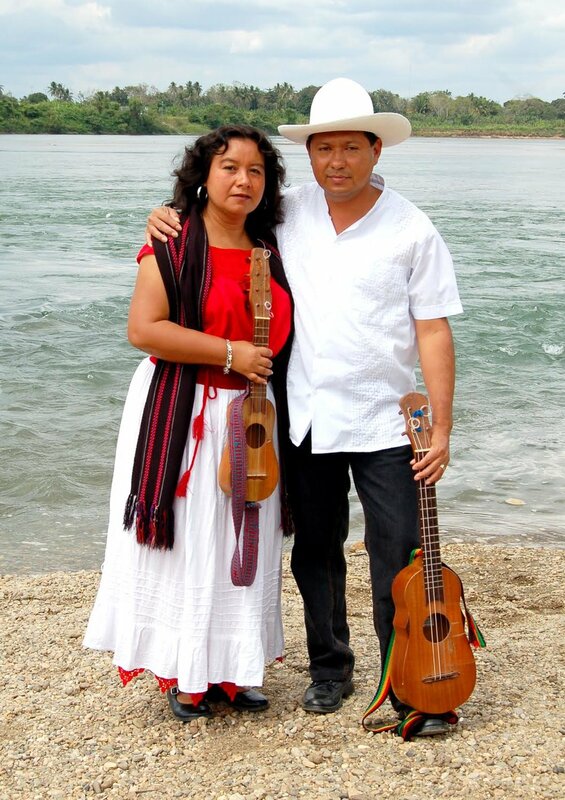 Julio Mizumi, Kojima, and Belen Torres Morales are musicians with expertise in the cultural practice of fandango. In addition, they are descendants of people who came from Japan to work in Veracruz in the early 1900s. Kojima and Morales also are part of an environmental project in Vera Cruz called Jardín Kojima. TREE OF AGREEMENT SONGWRITING with Quetzal and Familia Mizumi (Part 1): Participatory songwriting and community-building workshop. Learn how to turn words and thoughts into powerful poetry and song with our visiting artists! You must attend both Sessions. BOKASHI COMPOSTING with Sustainable Little Tokyo: Learn the Okinawan tradition of anaerobic composting, which composts meat and dairy! GROWING TREES IN CONCRETE with Omar Ramirez: A youth arts workshop inspired by Tupac and J. Duncan! Create a Tree Of Life depicting ancestral knowledge (roots), social influences inhibiting growth (concrete), your experiences (tree), and the cultural knowledge you wish to pass to the next generation (seeds). THREE TREES with George Sanchez: Stories of people of color in public land remain largely undocumented and uncelebrated. Together, we will weave our memories of land in connection to the resiliency of culture and communal memory. TREE OF AGREEMENT SONGWRITING with Quetzal and Familia Mizumi (Part 2): See Session 1. TREES & SEEDS with Leigh Adams & Jessica Perez: Create seed bombs inspired by the work of Masanobu Fukuoka, and weave poems, ancestors, and art into our Tree of Life sculptures, which will be displayed at FandangObon! SHARING OUR FOODWAYS with Crystal Gonzalez: Make and taste cultural food as we connect with each other. A hands-on workshop, engaging our taste buds as we learn history and traditions tied to specific foods. Everyone is welcome to bring a plant/fruit/food to present to the group. WHAT IS EATING US FROM UNDERGROUND… with LA Worm Farm Collective: Nourishment and resilience with worm poop! Plant seeds with a mixture of LAWFC castings and soil and join in a facilitated verbal share on the challenges and many meanings nourishment, and a practical demonstration on resilience and carrying seeds forward. Color Path of Memory uses color cards to spark participant memories of public land, including parks, gardens and natural landscapes as well as urbanscapes. Those memories, documented and woven together, bring to the foreground the stories of people of color in public land that remain largely undocumented and uncelebrated by historians, public institutions and environmental organizations. We need to remind ourselves that our communities, no matter how urban, have unique and universal connections to the land that ultimately speak to the resiliency of culture and communal memory. Come learn about urban gardening from a family who decided to grow a vegetable garden on every square inch of the yard. LA Green Grounds introduced this South LA family to this concept in June 2012 and they have been growing food at home ever since. In this workshop we will learn about creative ways to get a garden started with plant clippings, composting, and seed sharing. Learn about the mistakes and happy accidents that having an urban garden at home can bring to your life. How can urban gardens address the needs, culture, and challenges of a neighborhood? In this workshop participants will explore the benefits of public open space, learn about how short-term transformations of blighted space can have lasting impacts. Using overhead projectors, color, and forms participants will visualize, design, and present urban gardens on sites in Little Tokyo that are rich in history and at risk of development without community input. Join Tim Bevins of Global Green and Maya Santos of Form follows Function in this design challenge! Join us as we learn about amaranth grain and its historic and contemporary uses. Create seed balls inspired by the work of Masanobu Fukuoka and take some with you to plant culture, history, and food where you please. We also invite you to add some pieces to our community mosaic and enjoy the bringing together of disparate elements and creating a beautiful “whole.” Led by Leigh Adams, the Artist-in-Residence at the LA County Arboretum. The LA Worm Farm Collective will host a seed planting workshop using a mixture of LAWFC castings and soil. In this workshop, participants are invited to share anecdotes of their growing experiences. A facilitated verbal share on challenges to nourishment, and the many meanings of nourishment, will be held. LAWFC will end the workshop with one more practical demonstration in resilience and carrying seeds forward. Of course attendees are encouraged to ask questions of each other as well as of the facilitator. Happy worms, happy workers! FandangObon is an annual festival in Los Angeles that brings together the Japanese, Mexican, and African-American communities into one circle to share participatory music and dance traditions in order to celebrate Mother Earth. This video contains highlights of FandangObon 2015, held on October 25 at the Japanese American Cultural and Community Center in Little Tokyo, Los Angeles. Last August, Nobuko Miyamoto, Great Leap Founder and Artistic director, created "SEMBAZURU," an oboe dance for children dedicated to children who suffer from violence all across the world. Nobuko was inspired by the Story Of Sadako Sasaki, a 12 years old girl who died from leukemia after being exposed to the radiation from the Hiroshima bombing.